Hi Ken : I had been sky watching for a while and there was no signs of any strange activity so I turned around to go back inside when I spotted something out of the corner of my eye. I turned to get a better look only to see aHi Ken : I had been sky watching for a while and there was no signs of any strange activity so I turned around to go back inside when I spotted something out of the corner of my eye. 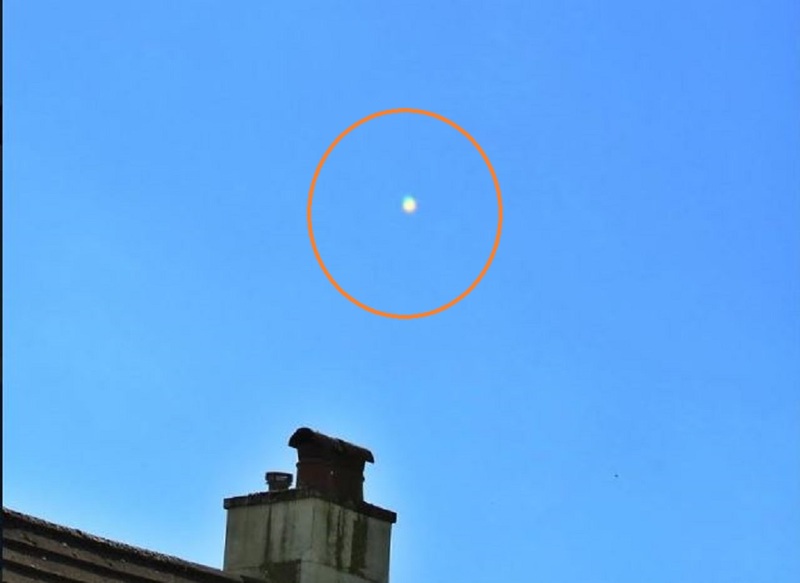 I turned to get a better look only to see a bright glowing orb hanging above an adjacent house. The orb was about the size of a tennis ball and had a yellow tinge to it. I quickly took a photograph of the orb and continued to watch as it remained stationary. I had the distinct feeling that the orb was checking me out so I decided to wave at the orb to try and get a reaction from it. The orb was about the size of a tennis ball and had a yellow tinge to it. I quickly took a photograph of the orb and continued to watch as it remained stationary. I had the distinct feeling that the orb was checking me out so I decided to wave at the orb to try and get a reaction from it. I waved and to my amazement the orb moved from left to right and then went back to its original position as if to acknowledge my waving. I was totaly astonished by this movement of the orb. The orb was definitely under some type of intelligent control. The orb continued to hang there for about five minutes until it started to get dimmer and dimmer before it just broke up into smaller round pieces that then just shot off in to different directions. I was absolutely astonished by what I had just witnessed… I had never seen anything like it before. This incident took place on the 13th of December ‎2016 at 11:18 AM at Newton Abbot Devon England. All the best John.